Reading can become a dope habit. Book-sickness is a modern ailment. Some people read for instruction, which is praiseworthy, and some for pleasure, which is innocent, but not a few read from habit, and I suppose that this is neither innocent nor praiseworthy. Of that lamentable company am I. Conversation after a time bores me, games tire me and my own thoughts, which we are told are the unfailing resource of a sensible man, have a tendency to run dry. Then I fly to my book as the opium-smoker to his pipe. I would sooner read the catalogue of the Army and Navy Stores or Bradshaw's Guide than nothing at all, and indeed I have spent many delightful hours over both these works. At one time I never went out without a second-hand bookseller's list in my pocket. I know no reading more fruity. Of course to read in this way is as reprehensible as doping, and I never cease to wonder at the impertinence of great readers who, because they are such, look down on the illiterate. From the standpoint of what eternity is it better to have read a thousand books than to have ploughed a million furrows? 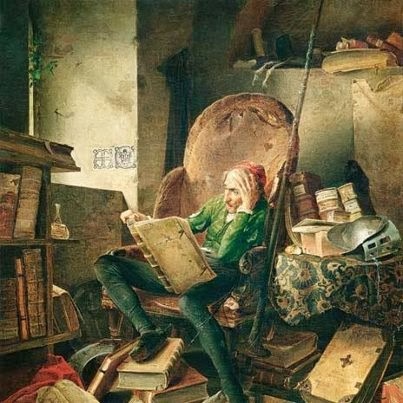 Let us admit that reading with us is just a drug that we cannot do without—who of this band does not know the restlessness that attacks him when he has been severed from reading too long, the apprehension and irritability, and the sigh of relief which the sight of a printed page extracts from him?—and so let us be no more vainglorious than the poor slaves of the hypodermic needle or the pint-pot.